In the NFL, the easiest way to be competitive is to be strong on both the offensive and defensive lines and have a solid quarterback. Being strong in those areas should put a club in a situation to be competitive in any given game. The Buffalo Bills offensive line played well last year but since, the group has lost two of its better starters and the Bills did not use free agency or the draft to obtain a potential top flight player on the line. That said, what is the outlook of the offensive line? Obviously in order to win with the O-Line, there has to be talent. On top of that, the group needs to be led by an excellent line coach. The Bills have one of the better line coaches in the National Football League in Juan Castillo. Around the League, Castillo is highly respected and known as an excellent teacher of offensive line technique. He has been coaching in the NFL since 1995 almost exclusively as an offensive line coach. He has developed several top players and like Head Coach Seam McDermott, Juan comes from the Andy Reid tree which is recognized as one of the best. Gone from the O-Line is center Eric Wood, a Pro Bowl caliber player. A neck injury forced him to retire prematurely. The other loss was guard Richie Incognito, who originally retired but then was waived when he decided to “un-retire”. Incognito is talented but has issues that the Bills brass no longer wanted to deal with. During OTA’s and mini-camp Wood has been replaced by Ryan Groy, a fifth year player who has had starts in the past because of injuries. Groy is very capable and while his play won’t be like Wood’s, the hope is that it won’t be far off. Right now the backup is free agent acquisition Russell Bodine, who was a starter in Cincinnati. The nice thing about either player is that they are capable of playing either guard or center. The current starters at guard are Vlade Ducasse and John Miller. Ducasse is now in his ninth year and has shown flashes of excellent play in the past. What he needs to do is turn those flashes into consistent play. Miller was a starter as a rookie and looked like he may become an excellent NFL player. Since, his play has fallen off. If he can revert back to earlier form he should be solid. The Bills drafted Wyatt Teller from Virginia Tech in the fifth round. Going into the 2017 season it was thought he could be a Day 2 selection but his play fell off as a senior. The Bills hope he can look like the player they saw in 2016. The Bills have two solid players at tackle. 2017 second round pick Dion Dawkins is the left tackle. It was thought that Dawkins was drafted to play guard but when he had to play tackle as a rookie he played well. 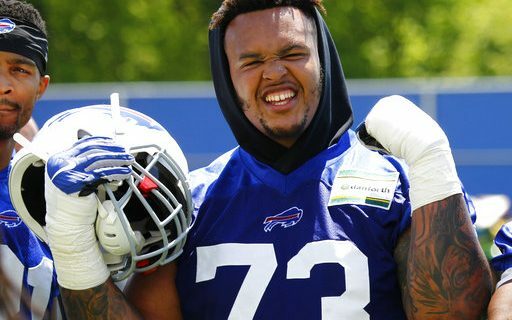 He doesn’t have the size of former starter Cordy Glenn but he is more athletic and at the all-important left tackle position, athleticism is a key trait. The right tackle is Jordan Mills who may never be an All Pro, but he is a steady player who could be a solid starter for many NFL clubs. The backups are second year man Conor McDermott and Marshall Newhouse. McDermott needed to gain strength and with an off-season in an NFL strength program that should have happened. He has a bright future. Marshall Newhouse has the versatility to play anywhere along the line and that versatility will make him a key reserve. He has started games in the past with good results while with other clubs. Overall, the line will be looked at as a question mark until we see them play live once the season begins. With Castillo coaching them, I feel this unit will be better than many “experts” feel. They key to any offensive line is that they have to play well as a unit and of course that is on Castillo. I have no doubt that he will have this unit playing winning football in 2018.